Coimbatore - There are many interesting tourist attractions in Coimbatore, which is the third largest city of Tamil Nadu. This beautiful city is located on the banks of the river Noyyal and is known as the textile capital of South India or the Manchester of the South. Earlier it was called as Kongunad, and it was changed into the present name by the British. In Tamil, it is called as Kovai. This beautiful city has a strong economy and a reputation as one of the greatest industrial cities in South India. Climate - Coimbatore is blessed with a good climate, as it is located in the shadow of Western Ghats. 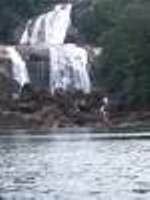 Some of the most beautiful waterfalls in South India are in this region. The enchanting Siruvani Waterfalls and Dam are about an hour's drive from here. Vaidehi waterfall, is located in Narasipuram village, 30 kms away. Thiruppur, an important textile centre. Bethesda Prayer Centre at Siruvani Hills. The landscape surrounding the prayer centre is beautiful with hills, water falls, green pastures and rivulets, providing the most peaceful atmosphere for prayer and meditation. Velliangiri Hills, known as the kailash of the south, with exotic flora and fauna, is located in the outskirts of the city. It is one of the sacred hills in South India, and lakhs of people undertake the arduous 8 km trek during Maha Sivarathri and Chitra Pournami every year. Rare medicinal herbs are also found on these mountains. Tamil Nadu Agriculture University, is here situated about 5 km from the city railway junction. It is one of the sixteen major agricultural Universities in the country and one of the best in south Asia. The world famous and the oldest forest institution called Forest College is here, which has an interesting museum. Parks V.O.C Parks, Uppilipalayam, Gandhi Park, R.S.puarm, Bharathi Park, Thadagam Road. Black Thunder Asia's number one theme park based at the foothills of gigantic Nilgiris. The Water park spread over 65 acres at Mettupalayam. Pollachi, an important commercial centre, is 40 kms away, with important temples. Avinashi temple, also known as the Banaras of the South, is the biggest temple in Coimbatore district. Madumalai Wildlife Sanctuary is just 67 kms away. Valperari,located 105 kms away in the Anamalai range and has many tea plantations and is a picnic spot. 958 Sq.Km and has many exotic fauna. Solaiyar Dam, the second largest rock dam in Asia,is 15 km from Valparai. Monkey Falls, 65 km away from here and 27 km from Pollachi on Coimbatore-Pollachi-Valparai Highways. Kodaikanal Hill station is just 138 kms away. Apart from the above, many temples are located in and around this city. They are Perur temple, Maruthamalai Temple, Eachanari Vinayakar Temple, Karamadai Ranganathar Temple (built by Vijayanagar kings), Masaniyamman Kovil,Puliakulam Temple (where Asia's largest Ganesha idol), Chemmedu Muthumariyamman temple, Ammanalingeshwarar Kovil, Avanashillingeshwarar Kovi, Dhyanalinga, which has the largest Shiva lingam in the world, Thirumoorthy Temple, the Sangameshwarar temple at Bhavani, The Mariamman temple at Bannari, and Murugan temple at Palani. Many Churches and Mosques are also there. For family entertainments, Kovai Kondattam is the best place. It is an amusement park situated in the Perur Road. It has an open air theatre for conducting different events, magical fountain, spiral tower, water pool, pirate ship and lot more events to make the visitors drench in ultimate fun. Hotel Alankar Granade - Located in the heart of the city. Hotel Rathna Residency Located close to the railway station.